Here at One Sure, we understand that finding the perfect, yet cheap caravan insurance policy can be a difficult task. Whether you’re caravanning somewhere sunny abroad or going for a weekend away in you static caravan Wales, it’s extremely important to have the right insurance policy to keep your caravan protected. Buying and upkeeping a caravan can get pretty expensive so financially, it makes sense to protect your vehicle with the best caravan insurance. One Sure Insurance offer cheap caravan insurance without compromising on the things you care most about. We compare over 10 different insurance policies to help ensure that you get the most competitive caravan insurance quotes on the market. Because we're a broker, we have access to caravan insurance schemes which direct insurers don't have access to - meaning we can often get the right caravan insurance policy at the right price. Although for some caravans, insurance isn’t necessary, it is your first line of defence for protection against loss or damage. If you’re towing a caravan with your car and you damage property or injure someone, your car insurance may cover that for you. However, your car insurance only provides third party cover which means your caravan isn’t covered against loss or damage. Some car insurance may cover a touring caravan but it’s essential that you check before going out in it. If you regularly go for weekends away, having caravan insurance is something you should definitely consider. If you were to have an accident, it could save you lots of money in the long term, especially if you’ve got an expensive caravan which would incur hefty repair costs. Static Caravan Insurance – Static caravans normally stay at the same site for a number of years, meaning you don’t have to tow it every time you want to go on holiday, this is why most people love static caravans. They normally come fully furnished with carpet, double glazing and electrics. Many people opt to buy static caravans as they’re much easier as you don’t have to worry about setting up and packing away at the end of your stay. You will have to pay an annual pitch fee however this will include costs for water, electricity and gas. Touring Caravan Insurance – Touring caravans also have some great benefits too. The fact you can pick which site to visit every time you go away, means you’ll never get bored of your caravan site. Buying a caravan, although it can be expensive to purchase, it’s much cheaper than a holiday and hotels. On top of this, most sites even have sports facilities such as swimming pools and tennis courts so you’re bound to find something to entertain you! Motorhome Caravan Insurance – A motorhome is far easier to drive than a caravan, your motorhome may even have reversing camera and parking sensors on too making it much easier to manoeuvre than a touring caravan. Motorhomes can be more expensive than touring caravans which means it is even more important for you to get the best caravan insurance possible. What are the Benefits of choosing One Sure For Caravan Insurance? The team at One Sure do all the hard work for you! We work with over 40 different insurance companies to help obtain a very cheap caravan insurance price, and the best caravan insurance policy for you. We pride ourselves on getting cheap quotes for our customers. We love pleasing our customers so we do everything we can to work for you. We constantly strive to give the best customer service experience on the market. Your happiness is our priority here at One Sure so if you ever have any questions or queries, don’t hesitate to give us a call! Are you worried about having caravan insurance to cover you when you’re travelling abroad? Want peace of mind that you are covered for any type of accident whilst you’re on holiday? If you’d like to venture a little further than the UK, we also offer a foreign use upon request. If this is something you’re interested in, give our friendly team a call today. We’re happy to accommodate your needs, just let us know what you’d like. We love to reward you! If you’re a careful caravan owner we offer a No Claims Discount for being claim free, which may mean you can still get cheap caravan insurance. As well as all this, our caravan policies come with a 2 month free breakdown cover! Furthermore, with your caravan insurance, we can also have an alternative accommodation policy if anything were to happen to your caravan, meaning you can still enjoy your holiday. Depending on when you passed your driving test, you may only be able to tow a certain weight of caravan. If you passed your driving test after 1 January 1997, you can only tow a total weight of 3500kg, including your car and caravan. If you passed your test before this, you may be entitled to pull a greater weight. If you’re unsure of your caravans weight, you can normally find details in your handbook so it’s worth checking! You could also look on Gov.uk to ensure you’re fully ready to hit the road. If you did want to tow a heavy load over 3500kg, you’ll need to sit a category B&E test. If you’ve recently purchased a caravan or you’re thinking of buying one, you may be unaware of the laws you have to abide to. Anyone towing a caravan must be able to see four metres either side and 20 metres behind, this means you may have to invest in some additional mirrors to make sure you have a good view of everything going on around you. Having additional mirrors is a legal requirement and it may help you avoid unnecessary accidents and therefore, possibly losing your No Claims bonus. You must be on a campsite when you’re in your caravan as you’re not allowed to park for a long period of time, on private or council land. You may risk breaking the law if you are found parked up on private land but if you’ve been there a long period of time! There are many laws and safety regulations you should be aware of if you have a caravan, otherwise you could get yourself into some serious trouble. There are hundreds of fantastic caravan sites that you can visit worldwide, whether you want to visit the South of France or Barmouth beach in Wales, you can find the perfect camp site for you! How can you protect your caravan? 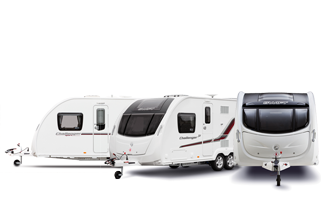 If you’re worried about your caravan being stolen, you may consider signing up to CRiS, also known as the Central Registration and Identification Scheme. If your caravan were to be stolen, being signed up to this scheme means the police have a higher chance of finding your caravan, so it’s essential you register once you’ve bought the caravan. If you’re buying your caravan second hand, make sure you re-register it in your name. Some caravan insurance companies won’t insure you unless you’re registered with this scheme. If your caravan has certain security devices, you may be entitled to lower cheaper caravan insurance costs. It may be useful to have devices such as an alarm, a tracker or even wheel clamps to prevent your caravan being stolen. When you leave your caravan to go out, it’s vital you lock the door and hide your valuable possessions. What Caravan Insurance cover can we offer you? At One Sure we offer three different types of cover to suit your caravanning needs. We provide one of the best caravan insurance policies on the market which is why our customers love us. Whatever your caravan passion is, we have the perfect policy for you. To start your caravan cover or enquire about a quote with One Sure today, feel free to call our friendly team on 0800 107 1259. Alternatively if you would prefer to contact us online, you can also complete a short form instead. Once you’ve completed the form, a member of our sales team will get in contact with you to discuss your quote or query.